As the saying goes: "Slow and steady and shotgun wins the race." 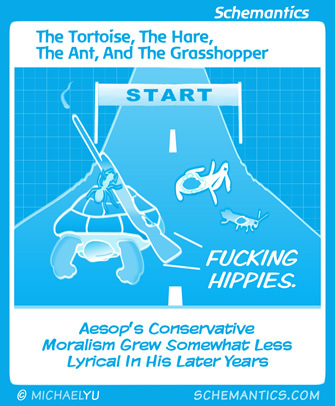 You might recognize the final scene from Easy Rider in this strip, but I'm pretty sure you've never read the Aesop's fable in which an elephant sodomizes a donkey. This comic is licensed under a Creative Commons Attribution-NonCommercial-ShareAlike 3.0 Unported License. You may copy, remix or otherwise modify the material as long as you give credit to the source (link back to the site).